Credit for tonight’s special edition post title goes to Facebook user, Thor Jokie, who commented on a still increasing thread under a post made by one band on Facebook about one hour ago. Yes, I know context is needed. 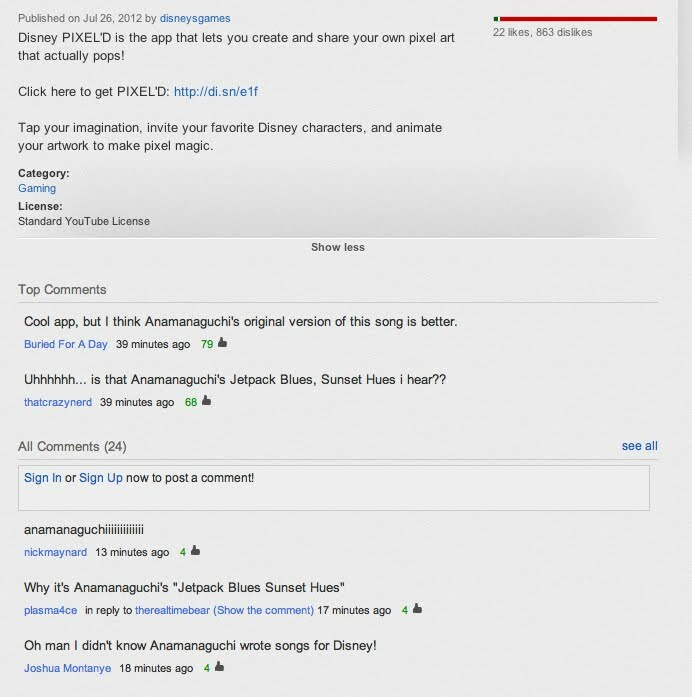 In a still unfolding series of events, it seems New York City based, 8-bit/”Fastest Power Pop” music group, Anamanaguchi has found one of their long established original songs, (or at least a strikingly similar version of such,) currently used in the background of a new app promo video that was posted by the Disney Corporation on July 26th 2012. Since there are many still evolving sets of social media messages and continually changing sets of available content, screenshots are the best material used here for the moment. The next screenshot pictured below is of just a handful of the top, more recent comments left by supporters of the NYC band on the Disney “Pixel’d” App promo video, which as of now live, are no longer visible and have been removed. Now, my personal opinion is that I definitely hear the main melody in both. Disney’s “version” is clearly modulated up several steps, but the core material is there. Sans the few sound effects audible for the the app itself, the rest is, at least to me, recognizably similar. What does this mean for our 8-bit songwriter friends from NYC? Well, opinion on trying to face off against Disney’s gargantuan resources aside, from a strictly technical standpoint, there does seem to be at least something the band can scratch at, in terms of legal stance. And don’t worry, this isn’t a pile of jargon. Presuming the band can prove copyright ownership and seeing as how the song can be heard anytime, in full, decipherable quality on the band’s SoundCloud, (thereby showing access,) and a plethora of ordinary observers (myself included, as I had not heard “Jetpack” up until tonight,) have clearly voiced their recognition of the melody from one source to the other and vice versa…at least at rough legal glance, this isn’t exactly a brush off of a coincidence, as many infringement claims are. What do YOU think, based on the audio and the rough test for copyright? Of course, while we’re being legally technical here, let me just openly state that I am in no way a lawyer, nor do I represent either the Disney Company or the band Anamanaguchi in any way shape or form –commercial, non or otherwise. My quoting of a test for copyright is merely to provide more than pure subjectivity to this unfolding situation and call attention to a hot button topic that involves active members of the music and creative industries. Pending additional major details becoming public knowledge, this article will be edited accordingly.